It is a fact that not every person naturally has guts to face new people around them or getting involved confidently with other people or in any gathering. Shy people feel uncomfortable with new people. They want to be alone where they feel comfortable with an environment. People with shy nature also have heart to meet someone special or to make new friends or to go on date with their loved ones. But the thing that bothers them in these types of engagements is their shy attitude. They want to engage in these activities but their shyness would not let them do this freely and confidently. Due to this so many issues can create and things will be change badly rather than to get better. 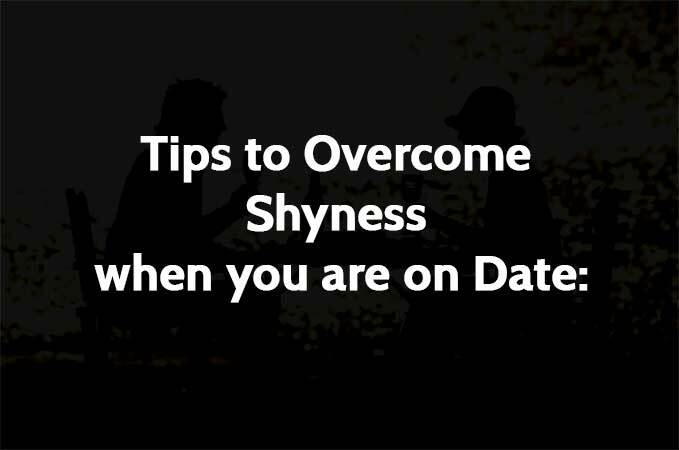 Here I am introducing some good tips related to overcome your shyness when you are actually with your date. Apply these formulas and you will see yourself more confident and less shy. You give some time on your body language. Check your way of walking, standing and sitting, and get prepared for these little things before you leave home to meet your date. It will be one of the first thing that will decide either you are going to be rejected or accepted. So keep your eyes on your body language primarily. Keep your focus on what you will wear on your first date. Dress is one of the most important thing which helps you to keep your body tone balance and confident. Choose free and comfortable dress to wear, so that you will be enjoyed your date. Dress reflects more than 50% of your personality. It will surely help you to cover your confidence level and to overcome your shyness. When you reached at the place in front of your date, try not to think much, this will give you uncomfortable feeling, and will leads your face expressions to be confused. Take your date as your friend and try to feel relax with him. Get advantage from your shyness. Keep yourself bounded in a level of decency. A girl without shy is like a bird without wings, so keep your level high with the help of your shyness. Usually a gentle man also likes shy ladies. No matter your date went good or bad. Just give positive comments at the end of your date. So that the other person will make sure that you liked spending time with him. It will help you to meet your date again, and will feel comfortable with you.